I am almost 9K miles away from my country. It is very long way from home and sometimes it feels like I am at the other end of the spectrum. One beautiful thing about this relocation is that I have met people from diverse culture in this far away land. How much ever my country is diverse my exposure was limited to the people from India itself. Here, going to grad school was one of the best decisions I took (really?). I have met people from different walks of life, culture, language, and country. There are a few who are here just like me to study and start a new life. A few others who are from this very own country carry different perspectives. Well, isn't that what travel is supposed to teach you? My previous exposure was just to Italians as my company deployed me on a trip to that beautiful country. However, this current stay in this part of the world has taught me a lot about South Korean culture, which I did not really know much earlier. This post is about that. The title of this post is 'hello' or 'how are you' in Korean language. Most immigrant students in the US are from China and South Korea followed by India. Thus, in my university too I have met a handful of South Korean students. My interactions with them about their culture has taught me more about their culture than I ever knew. While reading the newspapers or general news online, we always hear more about China and Japan and not much about South Korea. If we ever speak more of Koreans then it is about North Korean dictator Kim Jong-un. 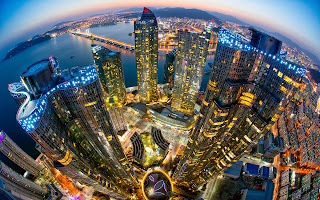 South Korea is actually very interesting in a lot of aspects. First of all, they are an extremely strong economy and rank 11th in this world. They are geographically blessed and picturesque and technologically advanced. 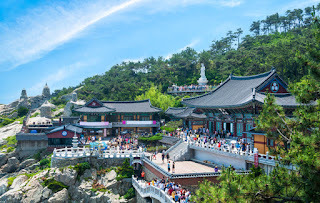 The pictures I have seen of South Korea validate their pretty landscape and beautiful mountains. Their success period after the 60’s has been a miracle in every sense and the South Koreans refer to it as Miracle of Han. However, what makes them successful is their hardworking nature. They really work hard. They are extremely motivated, competitive, and focused on their goal. I have seen many South Koreans and somehow it is hard to find one who is otherwise. This is probably due to their rigorous education system. They toil very hard and are pressured by the society and the school to do well. In fact, my friends (the ones I know) have had goals of coming to the US for doing their masters (at least that) even during their high school. There is a video that has been making rounds on social media, which shows the Japanese school lunch system (given below). This is not anything that is specific to only Japan as even South Korean schools follow the same. In fact my friends who probably did their elementary school 20+ years ago recall using the same system. They have grown their own vegetables and used that yield for their lunch, carried chopsticks, tooth brush (in fact they do that even now every day – thrice! ), towel, and of course served food for their classmates and most importantly cleaned their classrooms and corridor. I think this focus and discipline probably helped them to grow up the ladder and not remain what they were 50 years ago. They were poorer than even Mozambique before 60’s. Now, they are extremely rich.The Wi-Fi system is exceptionally good and the country is connected very well. I love South Korean products from notebooks, to pens, markers, bags and so on. The quality is really exceptional. I always keep telling my friend that I would like to visit their place to only shop. Yes, hopefully one day! The Korean culture is extremely socialistic and they give a lot of importance to the community and their family. The Hofstede's cultural index shows that on the scale of individuality they are far less individualistic than India. Well, America is the most individualistic country but India is also much more individualistic than the other Asian countries. In fact, even when they are this far, they prefer to socialize more with their own group than with others. When I went for a conference my friend disappeared in the evening as she had to attend the Korean group conference which is a group of Korean scientists. Wow! The conference I went to itself was a small one and imagine how the Koreans have formed a mini-Korean version of the same. Their language, Korean is also similar to the Dravidian language by at least a few hundred words. They call amma for mom and appa for dad. They also follow similar cultural traditions of respect to the in-laws (which is changing with time) and family. Interestingly, in the recent times, if their own parents help them raise their children, they will pay them. Food is also interesting as they consume a lot of rice. They eat pretty much every animal and this is an entirely different cuisine. Kimchi is one of the commonly associated foods to this culture. They also don’t cook tomatoes and usually consume it raw. They also celebrate their ancestors and share moments with families on special occasions to remember their ancestors (similar to shraddham or death ceremonies in Indian culture). 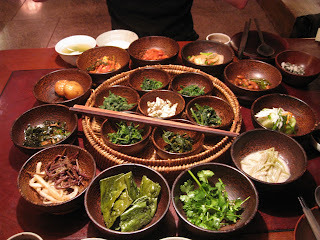 More is there to this lovely Seoul curry! Culturally they are very interesting as their yes and no’s are usually confusing. It took me a while to not get offended by my friend who would always say ‘yes ‘and ‘no’ for the most inappropriate questions. It is a cultural understanding and they do not mean harm. Coming from a hierarchical society they also do not question their seniors or elders that easily. It is interesting to see that culture clash in the US. Most of South Korea follows the philosophical bent of Confucianism, which focuses on respect and morality. Their governmental aids are also very appealing that the citizens are offered all health care and enough and more options to survive. This culture has always fascinated me but I did not know so much about them till I got to interact with people from there. The universities are so competitive and in fact as a research student, my friend was able to access most of the advertising data because it was archived by the government itself. Well that is my two cents about South Korea. I hope to visit that place once and probably will share my real life experience with you. My experience of Korean culture right now is the few Korean movies (they are really good!) I have watched and my interactions with my colleagues. For a person who is fascinated by the culture and beauty of humans around the world, every new understanding only reiterates my belief that we are all so different yet so similar and so connected as though a part of the same big yarn of wool. To life and more ! By the way, Thank you, Jinhee, my friend to have taken me on a tour to your lovely country even with our short conversations !